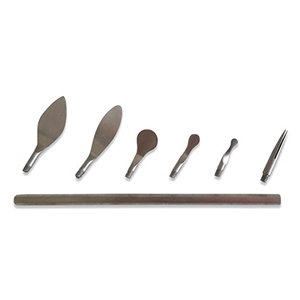 Our Encaustic Tip Tool Set is made up of 6 tips and 1 handle which allow the artist to create the standard basic shapes used in wax painting. You can either heat the tips over an alcohol lamp or carefully on a hot plate. These stainless steel tips are interchangeable ends which can be used not only with the supplied 6" handle but also with standard wood burning tool handles most commonly used in wax and Plastilina smoothing. and a 1 1/8" stiff wax tracer tip. All are angled for flexibility and their appropriate use. All sizes are approximate.